Enriched with facilities but not good looks, Toddington is a busy service area and the first in a while for traffic heading from the M25. First two hours free for all vehicles, after which cars must pay £15 and HGVs, caravans and motorhomes £30.50. HGVs can pay £32 to include a £10 food voucher. Prices are paid using PayByPhone - more details. The location code is 2469 (northbound) and 2470 (southbound). In Spring 2018, Transport Focus calculated a 72% satisfaction score for the southbound services, and 82% for the northbound services, making it second-worst and sixth-worst respectively. The head office for Granada services and later Moto, this combined with it being a very busy service station has meant it has often been used as a test bed by the firms for new ideas. Previously Granada had used Heston and their London office in Golden Square. Despite being one of the oldest services Moto owns, it's also one of their busiest and most profitable, helped by the fact that there aren't many services to the south-west. Plans for services at Redbourn were objected to by Granada and refused. Like all services in England, a new 50-year lease was signed in 1982. This was valued at £2,312,000, making it the most valuable. The last surviving Little Chef on the motorway network, built in 1996. 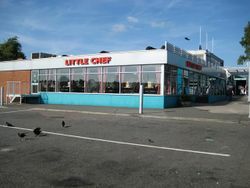 The Little Chef here was the last to leave the motorway network, lasting until 2010. It may well have lasted a little longer as Moto wanted to set up a Costa stand at the entrance to the services, but those plans were refused as inappropriate development, so Costa took over Little Chef instead. In July 2010, The Barber Shop on the southbound side, situated in a portacabin in the car park, closed and reopened in December 2011 as a Faith Room. 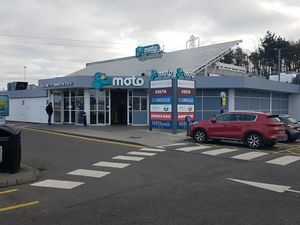 Fone Bitz used to have stores on both sides here however the southbound store closed in 2018. A KFC opened on the northbound side in January 2019.